Chief Executive Carrie Lam Cheng Yuet-ngor says the Hong Kong government will create a favorable atmosphere for the enactment of Basic Law Article 23. Several officials from Beijing had explicitly or implicitly hurried Lam to enact the security law over the past few years. Speculation has been rife that Lam would finally do so as it is believed by some to be a prerequisite for her reelection in 2022. 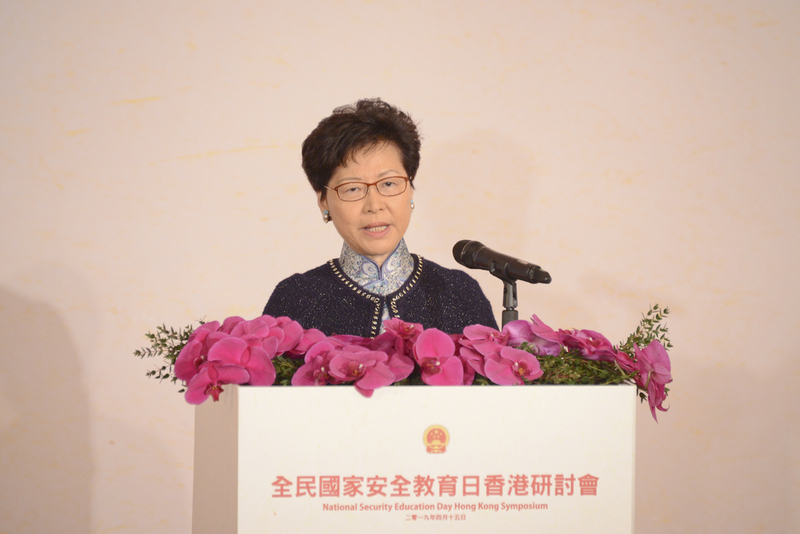 Addressing the National Security Education Day Hong Kong Symposium, Lam said enacting Article 23 is the Hong Kong government's constitutional responsibility. "The SAR government will weigh matters carefully and act vigilantly in creating a favorable atmosphere for the legislation so that Hong Kong society will handle this constitutional demand positively," Lam said. She said in the absence of Article 23 enactment, the government will use current laws to tackle independence advocacy. As an example, she cited the ban on the pro-independence National Party in accordance with the Societies Ordinance. "The absence of local legislation doesn't mean we will turn a blind eye to breaches of the constitution and Basic Law, as well as splitting the country and threatening national security," Lam said. "It also doesn't mean we will refrain from using current laws which can handle behaviors that should be strictly forbidden." She received a formal letter from the central government praising the banning of the National Party and asking for a report on the matter. Lam said: "We have reached the final stage of writing this report, and I hope to submit the report to the central government shortly." Also at the symposium, police commissioner Stephen Lo Wai-chung said independence advocacy is clearly against the Basic Law. "If we allow separatism to spread in Hong Kong, it will cause internal instability and have a serious impact on security and peace and order, so police won't tolerate such illegal behavior," he said. Paul Chan Mo-po, meanwhile, said Hong Kong's financial system should be the defense line of national financial security, especially since the SAR and mainland markets become more closer. "Hong Kong should act as the firewall and experimental field of the process," Chan said. "By guaranteeing the security of Hong Kong's financial system it isn't only important to Hong Kong's economy and society, but it's also an important defense line of the national financial security." He said the government should establish a supervision system to check the financial system 24 hours a day, while allowing for sufficient financial development.